A quick preview of Texans-Bengals on Thursday Night Football, plus notes on Carson Palmer, Andrew Luck and more. After a season-opening loss, the Texans turn to rookie Deshaun Watson to get them pointed in the right direction. 1. 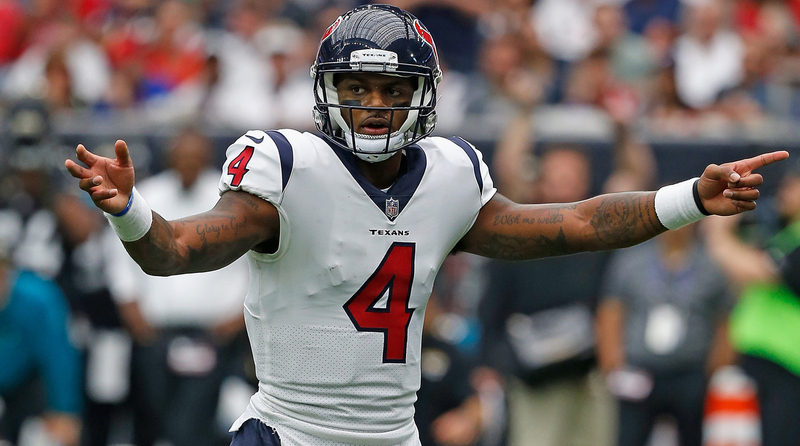 The two keys the Texans set for Deshaun Watson in getting ready to play this summer: 1) learn to run the offense efficiently; 2) avoid turnovers. We’ll see how he performs in a less than ideal environment—on the road, on a short week and playing behind an undermanned offensive line, without holdout Duane Brown. 2. The criticism of Tom Savage going back to college was that he was a “t-shirt-and-shorts guy”, which is to say his impressive physical traits didn’t carry over when the stadium lights turned on. After Sunday, those knocks seem to be fair, even when you account for Houston’s problems protecting him. 3. On the other sideline Thursday night, the Bengals have been concerned internally about how young tackles Cedric Ogbuehi and Jake Fisher would hold up. Their worries looked pretty warranted in Cincy’s shutout loss in Baltimore. The offensive line play will have to be better against J.J. Watt, Jadeveon Clowney and Whitney Mercilus. 4. Speaking of offensive line play, any coincidence that the teams that have their you-know-what together in that area—like Dallas and Pittsburgh and Oakland—held serve on opening day? 5. The hope in Baltimore was that two years of investing in getting younger and faster on defense would pay off in 2017. It did last Sunday. Linebackers Matt Judon and Patrick Onwuasor, corner Marlon Humphrey and tackle Michael Pierce were among the young guys who graded out well. Established centerpieces C.J. Mosley and Terrell Suggs also did their part. 6. Give the Dolphins credit for sweating the details in making Oxnard, Calif., feel like home this week. The coaches have raved about how their work environment has been replicated, right down to how the practice fields were painted just like they are in Florida to accommodate certain drills. 7. What’s devastating about the loss of David Johnson (he’ll miss 2-3 months with a dislocated wrist) for the Cardinals is what it means for Carson Palmer, with plans to build the offense around Johnson now out the window. Arizona felt, coming into the season, that it’s strength had shifted to defense, and the ability to pair a strong ground game with that unit would take the burden off Palmer. 8. Don’t be surprised if the Patriots shop for front-seven pieces between now and the trade deadline. Seattle castoff Cassius Marsh played full-time in the second half of the loss to Kansas City, just six days after the Pats traded for him, a clear sign of how much the team needs help in front of a star-studded secondary. 9. The secret seems to finally be out on Mike Daniels. It seems bananas that after five NFL seasons, and the signing of a four-year, $42 million contract two years ago, he still doesn’t have a Pro Bowl selection to his name. Performances like Week 1, when the Seahawks had no answer for Daniels in Green Bay’s 17-9 win, should help change that. 10. When will we see Andrew Luck? Given the Colts’ state of transition, the plan is not to activate him until his shoulder is absolutely 100 percent. I’m told, as I write this, that Luck is working through a strength and throwing program, as part of his effort to get back.